Carolina Reaper is officiallythe Worlds Hottest Pepper. 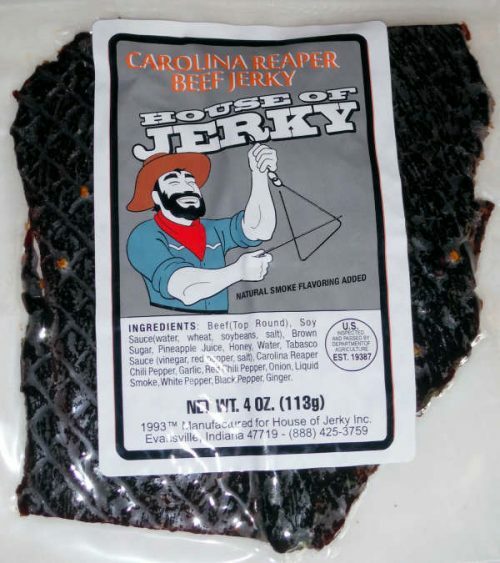 If you like it hot then this beef jerky is for you! Ingredients: Beef (top round), Soy Sauce, Bown Sugar, PinnapleJuice, Honey, Water, Tabasco Sauce, Carolina Reaper Chili Pepper, Garlic, Red Chili pepper, Onion, Liguid Smoke, White Pepper, Black Pepper, Ginger.